On December 6 comes the feast of the Christmas saint, St. Nicholas, although most of our celebration of this feast comes on his vigil, December 5. We find a puppet show a delightful way to tell his story, explain his relation to the Christ Child, and introduce the hanging of stockings for his feast day. 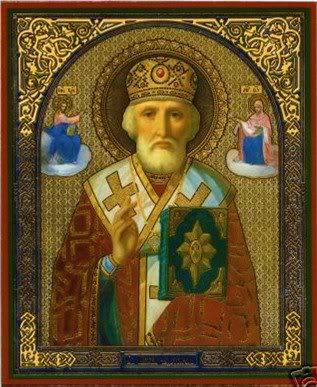 St. Nicholas was really a Turk born in Asia Minor. For a long time he was Bishop of Myra (near the southern coast of Turkey to the right of the Island of Rhodes – in case you look for it on a map). An orphan, he grew in love of God, became a priest, and made a pilgrimage to the Holy Land to venerate the places of our Lord’s life. On the voyage, a terrible storm threatened to sink the ship, but by his prayers all were saved. For this reason he is venerated as patron of boatmen, fishermen, dock workmen, and sailors. Returning to his native land, he was made a bishop; his generosity and love for the poor and for children, as well as his many miracles, endeared him to Christian people all over the world. He is also venerated as the patron of scholars, coopers and brewers, travelers and pilgrims, those who have unjustly lost a lawsuit, and as patron and annual benefactor of schoolchildren (especially boys), and is invoked against robbers and (in Holland) for protection of seafaring men. Many legends surround St. Nicholas, among them the one saint story I personally cannot abide: the tale of the three little boys murdered and salted down in a tub is too much.’ We never tell it. The story we like best is the well-known tale of the three marriageable daughters who were nevertheless unmarriageable for want of dowries. Hearing of their plight, the saint went silently by their house one night and tossed a bag of gold through the window for the oldest, who not long after found a husband for herself with no trouble at all. Then he crept by a second time and tossed a bag of gold through the window for the second daughter, who likewise was suddenly at no loss for suitors. As he was about to toss the gold through the window for the third daughter, the father of the girls caught sight of him. Throwing himself at his feet, he thanked him, confessed his sins, begged his blessing. Plainly it is from this story that the tradition has grown wherein St. Nicholas is said to leave gifts, candies, and sweets on windowsills, in shoes, and even in the stockings of good little children. It is the Dutch diminutive Sinter Klaas (“Sant Nikolaas”) that became, by way of the New Amsterdam Dutch, the familiar American Santa Claus. It is among the Dutch also that we find the appearance of Black Peter, his page, who follows him, distributing switches, coal, straw – whatever – to the naughty children as St. Nicholas gives treats to the good. Black Peter appeared in the Dutch festival after the invasion of Holland by the Spaniards, who brought black servants with them. 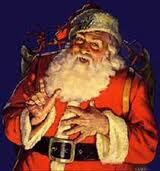 “Telling the truth about Santa Claus” need not rob children of their Christmas magic. 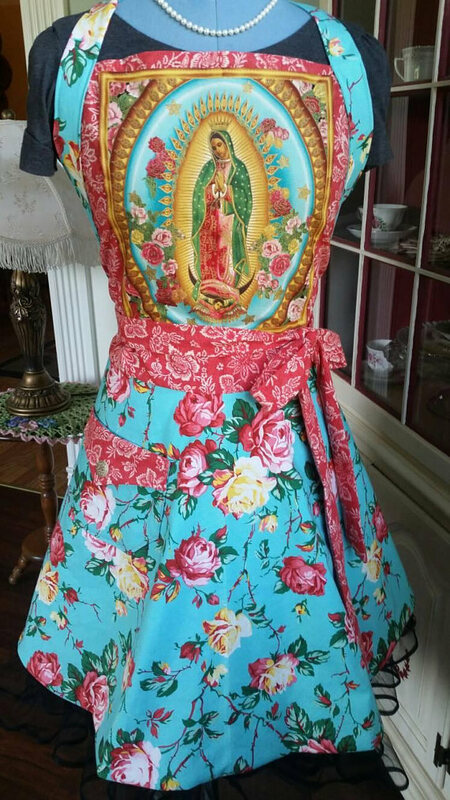 It adds to it with another feast to celebrate, another saint to know and love, another emphasis gently persuading them to meditate on the coming of the divine Child. And if we really fear to take away that part of it which is surprise, that marvelous moment Christmas morning when the presents are at last mysteriously there, be assured the little ones continue to pretend. Our littlest ones, knowing the truth, continue to pretend that it is all assembled in the most mysterious and magical fashion. It is like the circle that never ends. God loves mothers and fathers and gives them children they will love, and they teach the children about God, and the children love God, and since God wants them all with Him in Heaven, He sends His Son who loves them so much that He gives up His life for them, and that is so much love that it pays for their sins and buys back Heaven for them…. At Christmas everyone is so happy about all this that we all give each other presents. Shouldn’t that be the reason we give and receive presents? It would be a little embarrassing to be asked, “Don’t you think the Christ Child is an adequate substitute for Santa Claus?” and feel you must answer no. He really is and He must become the all of Christmas for families who are going to try to live lives of deep faith. It is not really worth it to toss in this “little white lie” when we are trying so hard to teach children impeccable truthfulness. Probably not all children who discover there is no Santa, when they have been told by their parents that there is, will consider their parents dyed-in-the-wool liars, but there is the danger that they will discount some of every other truth they are taught. This is an age when accuracy and unadorned truthfulness are not particularly in vogue. Yet a concern to speak the utter truth in everything will teach a child better than anything else how to be utterly truthful himself, how to be honest with his own conscience – which is the same thing as being honest with God. Santa Claus is not a serious lie, but St. Nicholas in his rightful place, gazing with us at the Christ Child, is a much lovelier truth. This kind of revelation is guaranteed to leave nothing but heartache behind. Without proper explanation or background, it is really cheating a child of something he dearly loves. Most children can learn to keep their own counsel about this; where there is disparity on the subject in the neighborhood, with love and tact the mothers can explain and help prevent unpleasant exchanges. No sooner are the words out of your mouth than you could bite off your tongue. But it has been said. The ugly implication is there: you might not get presents for Christmas. St. Nicholas’s feast is an ideal time for straightening out this problem of being good and not being good before Christmas. It is true that the issue should have something to do with the end result, but when we threaten this way, we forget that the reason God the Father sent the Christ Child wasn’t because everyone had been good, but because they hadn’t been good. 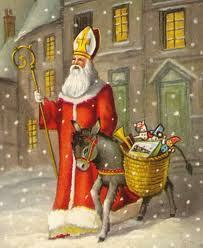 To transfer the burden of the “be good or else” problem to St. Nicholas is infinitely more comfortable. Here the threat involves no more than a stockingful of cookies, but it is a prospect sufficiently dreadful to give them pause. It also involves a happy solution to the naughtiness. No good behavior – no cookies. It usually works (I speak from experience). The shock of seeing that you meant what you said, of hearing St. Nicholas warn you the night before and discovering he meant what he said, is most salutary. Most enfants terribles will stand dolefully watching the more virtuous munching their cookies and make a superb effort to mend their ways, and yet the event is not of such magnitude that it leaves any permanent scars. People always ask how we handle the delicate business of sharing should this occasion produce one or two malcontents without cookies. We are all, of course, very sad to see they have no cookies, but if it is a warning and a punishment, then it is a warning and a punishment. Character training is involved, and also your own authority. No cookies – shared or otherwise.